Gramma dejongi: Yes, this is Happening! 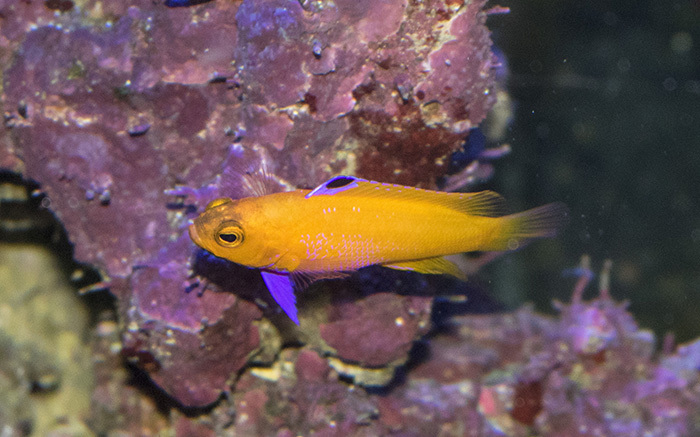 By Todd Gardner Grammas are a group of small tropical Atlantic and Caribbean reef fishes belonging to the family Grammatidae which they share with the genus, Lipogramma. 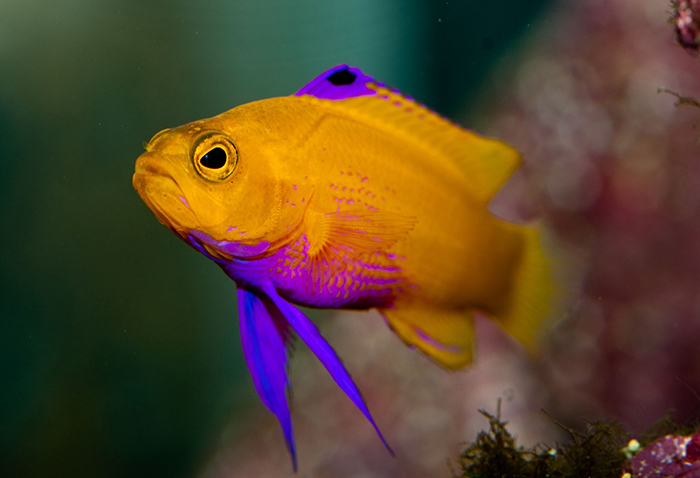 The family is commonly referred to as the reef basslets, a name that indicates their close evolutionary relationship with the true basses (Serranidae), as well as their diminutive size. The spectacular Gramma dejongi, one of the holy grails of aquarium keeping. Photo by Todd Gardner. The genus Gramma is comprised of five species: Gramma brasiliensis, G. linki, G. loreto, G. melacara, and the recently described G. dejongi. 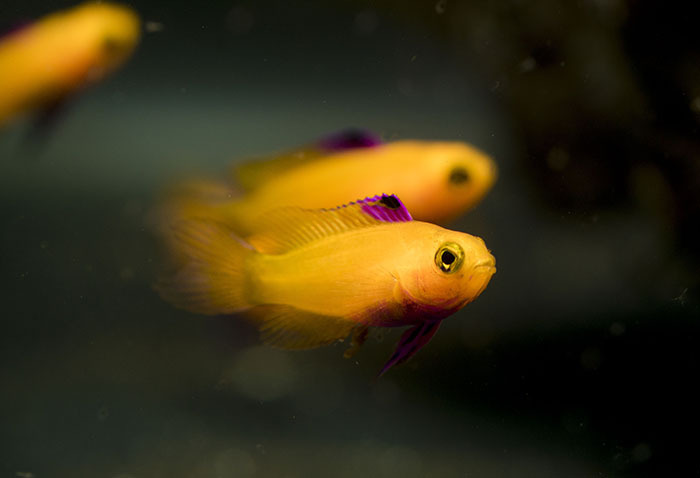 While all five species are encountered in the aquarium fish trade, availability and price varies considerably between species. This variation is due primarily to depth and geographic distribution, with G. loreto, the shallowest and most widely-distributed, coming in at the lowest retail price (around $20 US). G. linki and G. melacara occur in deeper water and therefore are significantly more valuable, often retailing for $70-$100 US. 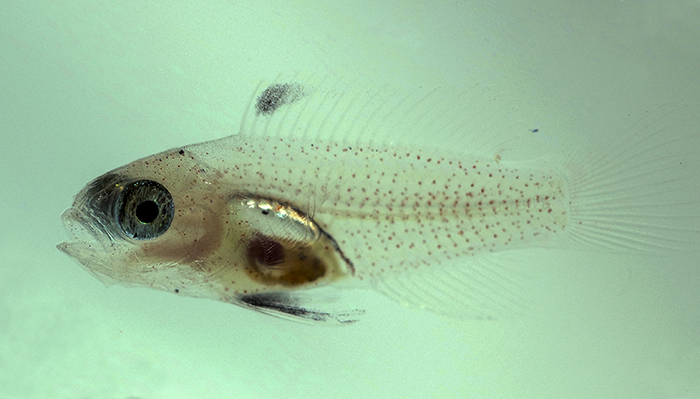 G. brasiliensis and G. dejongi are found in shallow water, but have restricted geographic ranges which tends to limit their availability in the trade. 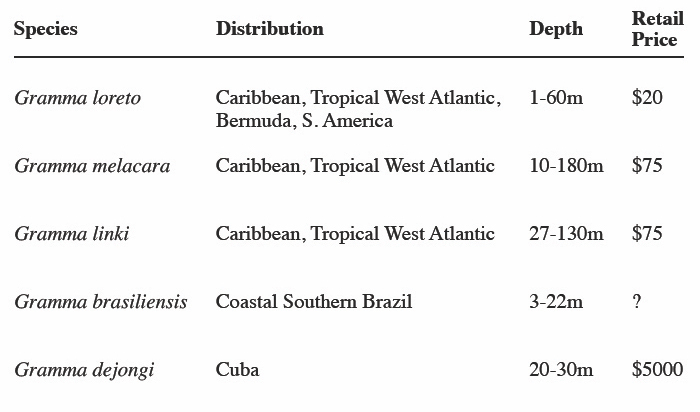 G. brasiliensis is endemic to Brazil and G. dejongi, so far, seems to be endemic to Cuba, however there has been at least one record of G. dejongi in the Cayman Islands. The limited distribution of G. brasiliensis is probably related to patterns of ocean circulation. There is no mechanism to transport coastal Atlantic water from southeastern Brazil into the northern hemisphere without first circulating the entire loop of the South Atlantic Gyre. This would effectively prevent tropical larvae off the coast of Brazil from entering the North Atlantic. In the case of G. dejongi, it is likely that the extremely small home range is due to its very recent divergence from G. loreto. In other words, it may just be such a new species, that it hasn’t had time to spread yet. Hopefully the combined pressures of collection for the aquarium trade, encouraged by its insanely high price, and predation by the invasive lionfish, Pterois volitans, won’t prevent its eventual spread throughout the Caribbean. The genus Gramma is comprised of five species: Gramma brasiliensis, G. linki, G. loreto, G. melacara, and the recently described G. dejongi. G. loreto at C-quest 1997. Photo by Todd Gardner. Until this year, our understanding of the reproductive ecology of Gramma dejongi has been based entirely on inference from its close relationship to G. loreto. 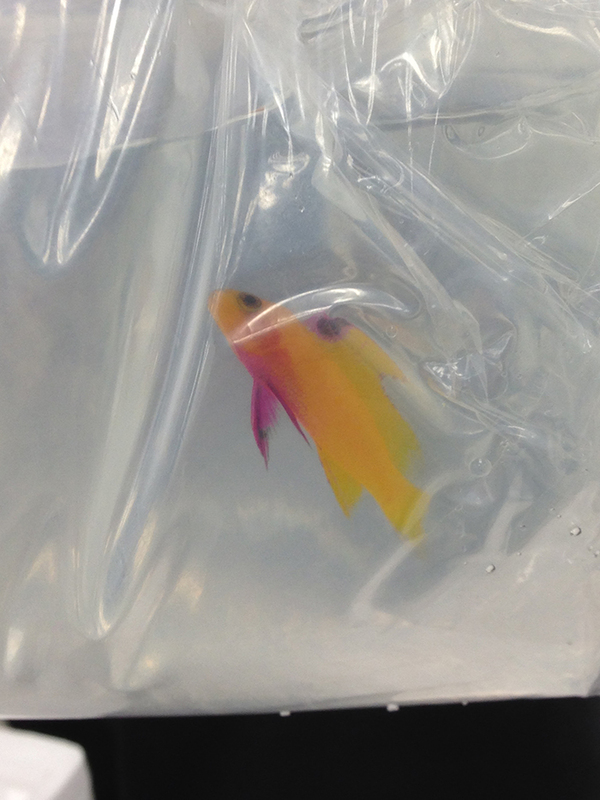 In recent months however, at the Suffolk County Community College Marine Science Lab in Riverhead, NY, G. dejongi has been bred in captivity for the first time. Our first successful spawning season has demonstrated that in fact, all facets of reproduction appear to align very closely with G. loreto. Male G. melacara guarding nest. Photo by Todd Gardner. Acquisition of Broodstock This story began in 2011 when I first learned of the existence of Gramma dejongi. It was discovered by Arie De Jong of DeJong Marinelife, near his collecting station in Cuba in 1999 or 2000. Although there was some initial speculation that it might just be an extreme color variant of G. loreto, Arie was confident that this was in fact a separate species. The first specimens entered the trade in 2006, and it was officially named and described as a new species in a paper by Victor and Randall in 2010. 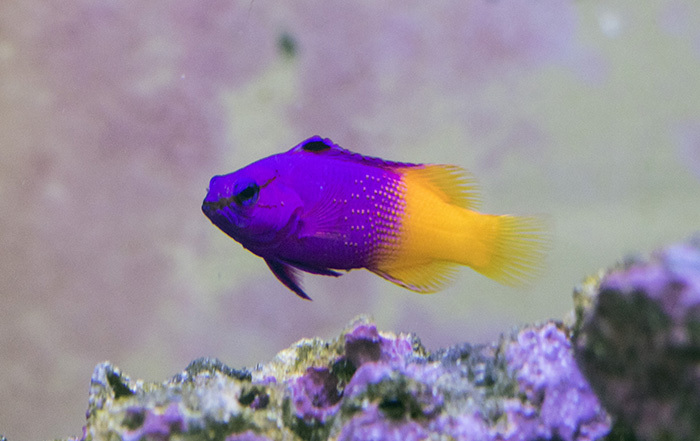 This beautiful new basslet was an instant sensation around the world, and its limited geographic range ensured it would fetch a very high price. 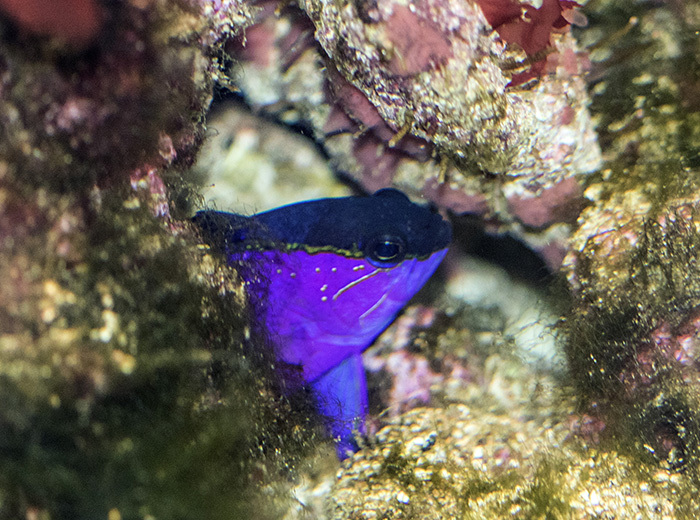 One other limitation to its availability was immediately evident to U.S. hobbyists: Our longstanding trade embargo against Cuba would prevent G. dejongi from entering the aquarium trade legally. Even if we were to import them from DeJong Marinelife in the Netherlands or other distributors, they would still be considered a product of Cuba and would be in violation of the embargo. This all made for an interesting problem for me as a fish breeder. This is one of the most difficult reef fishes in the world to obtain, yet if I could only get my hands on some, maybe that could change. After my first experience raising Gramma sp. in the 1990s, I declared them unfit for commercial aquaculture. I had reared a couple of broods of G. loreto from our broodstock at C-quest. 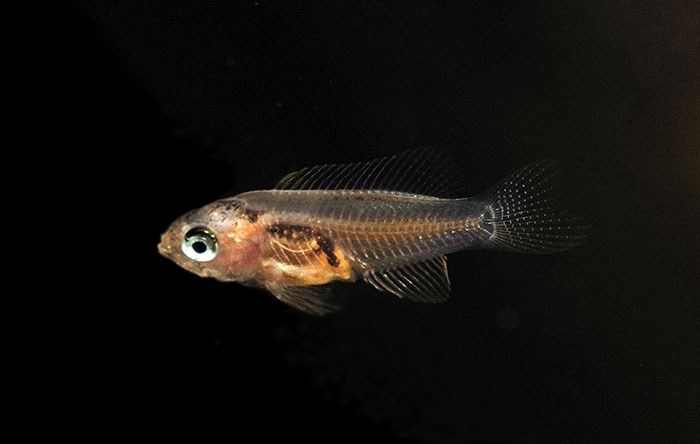 Although it wasn’t the first time they had been bred in captivity, I believe it was the first time captive-bred Gramma sp. were available in the aquarium trade. The problem was that their nesting and spawning behavior, coupled with their low price made it nearly impossible to culture them profitably. Additionally, the larvae are extremely sensitive to bacterial blooms in the rearing tank, leading to high mortality. This is also true of the dottybacks (Pseudochromis spp. ), but dottybacks have much larger spawns which helps to offset the mortality. G. dejongi, however, represented a very different scenario. With offspring priced in the thousands of dollars (vs. tens of dollars), the extra effort would certainly pay off. These little fish are true globetrotters – making their way from Cuba, to the Netherlands, to Japan, to Los Angeles, and finally to Long Island, NY. Photo by Brian Cook. I began researching the conditions of the embargo, its enforcement, and what kinds of permitting might be required to get around it. I started by inquiring with a friend of mine who was an enforcement agent for the U.S. Fish and Wildlife Service, an agency within the Department of the Interior. He told me that embargoes were not part of their directive and he referred me to a colleague in U.S. Customs and Border Patrol, who was happy to tell me about how much trouble I could get into for importing anything from Cuba, but that I would need to contact someone at the Treasury Department, which is responsible for the enforcement of sanctions and embargoes. Hours of perusing the Treasury Department’s website yielded very little useful information. It appeared that the permit I was seeking didn’t actually exist. I settled for filling out an online form and writing a letter to the Chair of the licensing division of their Office of Foreign Asset Control (OFAC). I explained that I was employed at a public aquarium and taught a variety of biology courses and that this fish represented a unique opportunity to educate the public about the evolutionary process of sympatric speciation and that breeding it in captivity would serve as a valuable tool for gathering data that would enhance our understanding of its ecology and evolution. A few weeks later, I received a letter informing me that my request was under consideration. Approximately four months later, I received another letter granting me permission to import two individual Gramma dejongi into the U.S. At this point, I wasn’t even sure how I would pay for them. They were listed at $2000.00 US from Dejong Marinelife. This did not include any shipping and handling charges. There was another cost to consider as well. Since I don’t have a general permit to import wildlife, I would need to enlist the help of someone who does. In other words, I would need to pay a U.S. marine life dealer to import them for me. The realization that the cost of getting these two fish here could easily reach or exceed $8000.00 was sobering. It felt a little risky. I found a tentative source of funding (a loan), then made an inquiry to DeJong Marinelife. Arie informed me that they did not currently have any G. dejongi in stock and that his divers hadn’t seen any for a while. While this news was disappointing, the responsible adult in me felt a little relieved that I wouldn’t be taking this financial risk just yet. For the next several months, I corresponded with Arie about the availability of G. dejongi. A year or so later, I heard back from Arie. He had them in stock and was ready to ship. Fortunately, by that time, I had been introduced to Jared Goldenberg of Fluid Dynamics International, who informed me that he had a wealthy client who wanted to invest in the future of aquaculture and was willing to put up the money for the G. dejongi. As we scrambled to set up the transaction, I pulled my letter from the Treasury Department out of my desk drawer and discovered, to my horror, that it had an expiration date, and that date had passed. I informed all parties and immediately wrote a letter to my contact at OFAC, asking to be granted a renewal. I also decided to go out on a limb and ask for the number to be increased from two, to six individuals. Once again, I received a letter of acknowledgement a few weeks later, this time followed by a phone call. The agent asked me a few questions, then told me to be prepared for a long wait. G. dejongi on arrival. Photo by Todd Gardner. After three months of waiting, I sent an e-mail inquiring about the status. I was given a number to call, which led me to an automated menu, where I was eventually informed (by a machine) that my case was pending. For the next two years, I called this number faithfully each week, only to receive the same answer. Occasionally I would try a different extension or write another e-mail, or leave someone a voicemail message. I never received a response to any of those messages. One day, as I was relaying this story to one of my colleagues, he suggested: “Why don’t you write to your representative?” My initial response was to laugh, but after a few minutes, I decided that it was actually a great idea. I went to Chuck Schumer’s website, followed the multi-step process to get him a message, and relayed an abridged version of the story to date. Two weeks later, I received a letter in the mail from his office. It was a copy of his letter to the Treasury Department, which essentially said: “See below.” Below, was my letter to him. Two weeks later, my permit arrived. G. dejongi in acclimation bucket. Photo by Todd Gardner. Broodstock tanks. Photo by Todd Gardner. Our broodstock of six juvenile Gramma dejongi arrived in the spring of 2016, in perfect condition (a testament to the expert handling practices of all involved). 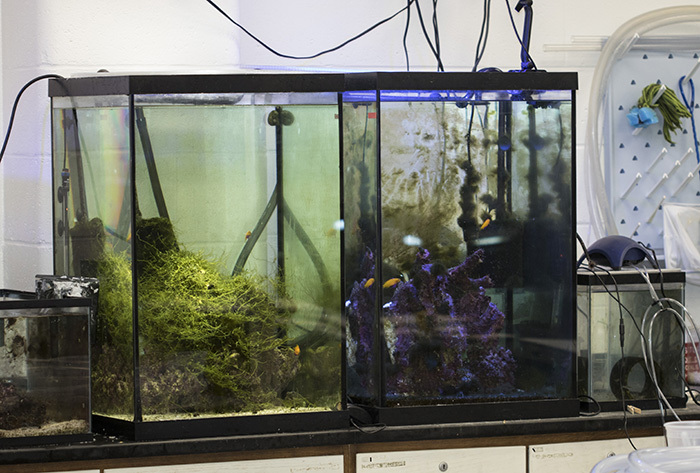 I decided to divide them into two groups of three in 46-gallon column tanks, each with a Fluval canister filter, a 75-watt heater, live rock, and a modest clean-up crew of assorted algae-eating snails and hermit crabs. The tanks were essentially identical to two tanks that were already established with pairs of Gramma loreto and Gramma melacara. I figured as long as I was working toward improving techniques for collecting and rearing Gramma larvae, it might be useful to have access to as many larvae as possible. Also having these species spawning and developing side-by-side would provide some excellent opportunities to compare their reproductive ecology and developmental patterns which might someday enhance our understanding of the forces driving their divergence from a single ancestor. Female G. dejongi in broodstock. Photo by Todd Gardner. Broodstock fish are fed 3-4 times each day. 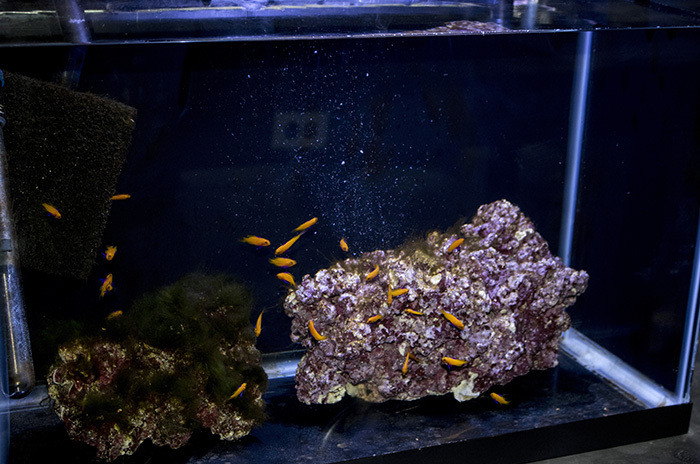 They receive a combination of LRS Fish Frenzy, LRS Fertility Frenzy, assorted fish roe, and saltwater mysids. I knew it was likely that the spawning season for G. dejongi would coincide with that of G. loreto and G. melacara (January-May). Nevertheless, since it had not been documented, I began placing a larval light trap (made by Chad Vossen) on the tanks several times each week once they were settled in. G. loreto in broodstock. Photo by Todd Gardner. Larval rearing tank. Photo by Todd Gardner. During the spawning season, larval traps are set as often as possible, at least one hour after the last feed, and checked each morning. Traps typically contain from 0 to approximately 100 larvae. The average length of larvae is just over 3mm on hatching. 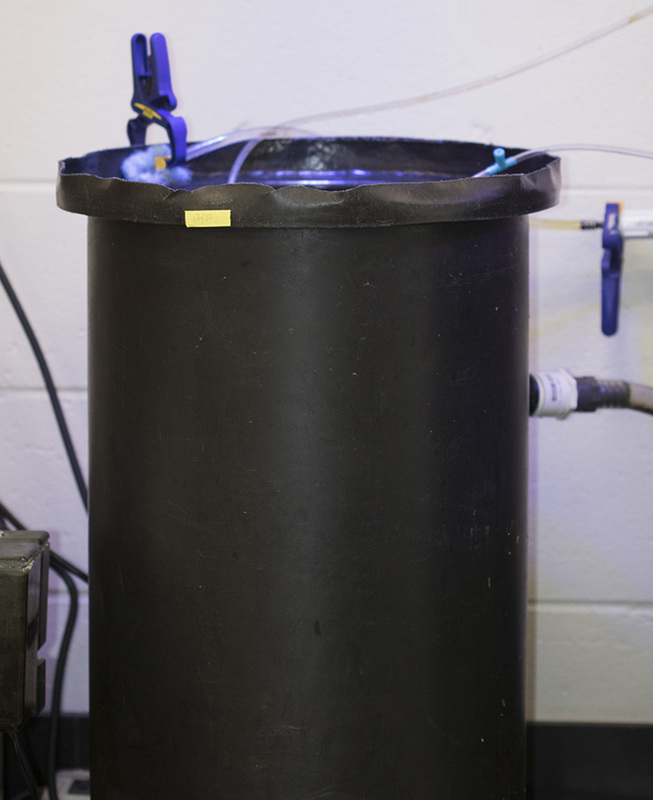 They are placed in black plastic cylindrical tanks of 5-10 gallons with gentle aeration, bright light (24h/d) and enough phytoplankton (Isochrysis and Tetraselmis) to obscure the bottom. Synthetic seawater (from ESV) is maintained around 30ppt. Rotifers and Copepods (Parvocalanus sp.) are introduced on day 1 and although I attempt to maintain the food density between 6 and 20 per ml through addition and flushing, it is not always possible. Between day 5 and 7, I start a continuous flow of water from a central system containing fluidized plastic bio balls, a protein skimmer and UV sterilizer. Food organisms are added as needed and phytoplankton is added each day. Flexion and its associated die off occur between days 12 and 14. Around this time I start introducing larger copepods (Acartia sp. And Pseudodiaptomus sp.) 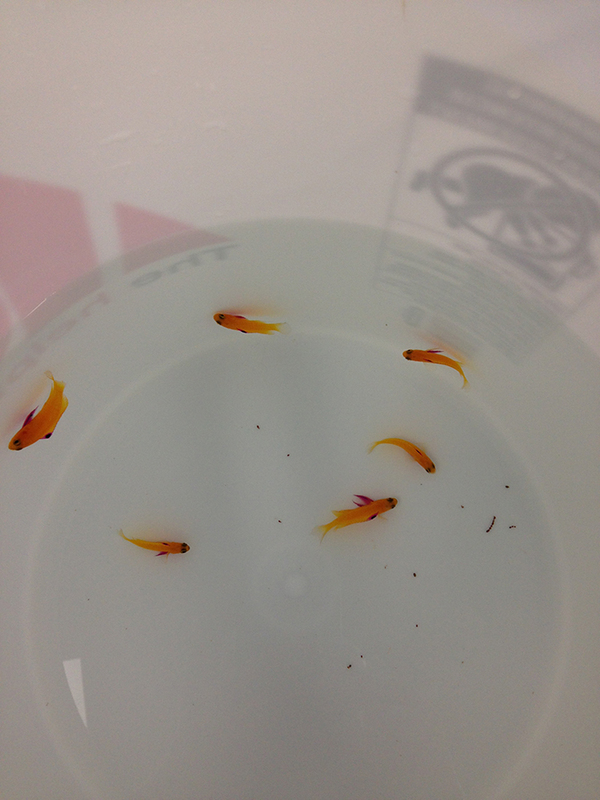 and Artemia into their diet. All copepods are obtained from Algagen, Inc. I would use only copepods if I could grow enough in my limited space, but since that is not the case, I am forced to hatch Artemia daily during this period. The Artemia is enriched by immersion in a dense mixture of available live phytoplankton overnight. G. dejongi at settlement. Photo by Todd Gardner. Settlement begins to occur at 5-6 weeks post hatch, and for a given brood, can span a period of two weeks or more. Although I normally wait until settlement is imminent before introducing non-living foods, I am certain that they would start eating them earlier. After settlement it takes 2-3 days to complete metamorphosis and exhibit juvenile coloration. G. dejongi metamorphosed. Photo by Todd Gardner. 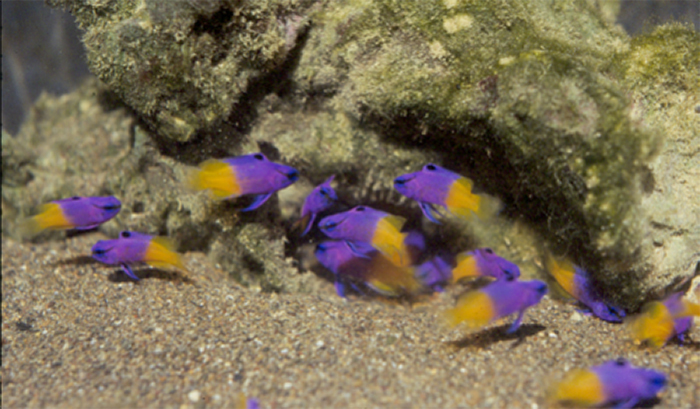 G. dejongi juveniles. Photo by Todd Gardner. What’s Next? 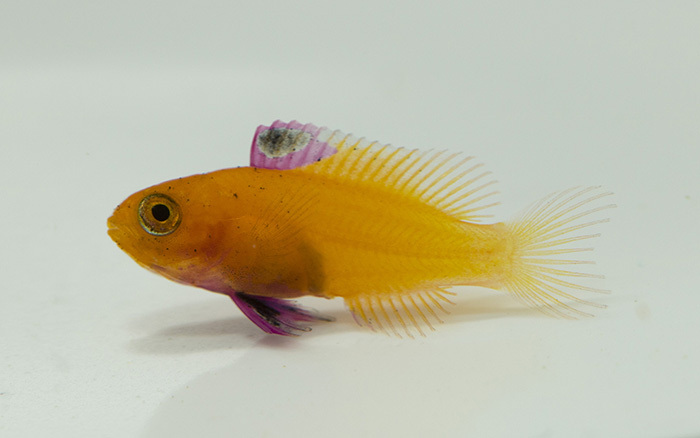 This first spawning season has resulted in a modest success in the production of captive-bred Gramma dejongi and if my experience with G. loreto is any indication, then we can look forward to more robust spawns and an increase in fecundity next season. Equally exciting is the news, reported a few weeks ago on Reefs.com that these captive-bred offspring are not subject to the trade embargo and can be legally distributed in the United States. I am hopeful that this marks the beginning of much more widespread breeding and availability of this beautiful new species, not only for the enrichment of the aquarium hobby, but also for the sake of its own preservation. Although Arie DeJong and his divers have observed G. dejongi beginning to appear in new locations, it is always much less abundant than G. loreto. Whereas this is neither unexpected nor alarming, they have made another observation that is deeply troubling. The invasive lionfish, Pterois volitans, an important predator of both species appears to have a preference, perhaps based on visibility, for G. dejongi. Arie sites the specific case of a lionfish that was cut open after having been speared by a diver. Its stomach contained 12 G. dejongi and not a single G. loreto. G. dejongi in growout. Photo by Todd Gardner. The future of Gramma dejongi will be shaped by its ability to adapt and disperse, by the spread of the lionfish, by human impacts on ocean ecosystems, and now, thanks to overwhelming support from the aquarium industry, by captive breeding efforts. I am incredibly grateful for the opportunity to work with this amazing fish.